I've always loved hats. They may not be part of my everyday wear but I love to pull one out once in a while to spice up a look. This hat I bought recently and I just love the added touch of the conchos. This look was really inspired by two bloggers; Angela Rozas Saiz and Jennifer Grace who I admire for their style and who both love their black wide brim wool hats like this one. Aside from the metallic wedges this is a perfect fall outfit that I'm already living in. What's not to love when you have a combination of leather, oxblood, metallics and your favourite knit? I've stocked up on my fall shopping and I'm ready to take on the season with my warmer outfits so stay tuned for more to come!! gorgeous photos! and i love the outfit! Love the casual glam vibe of this look! 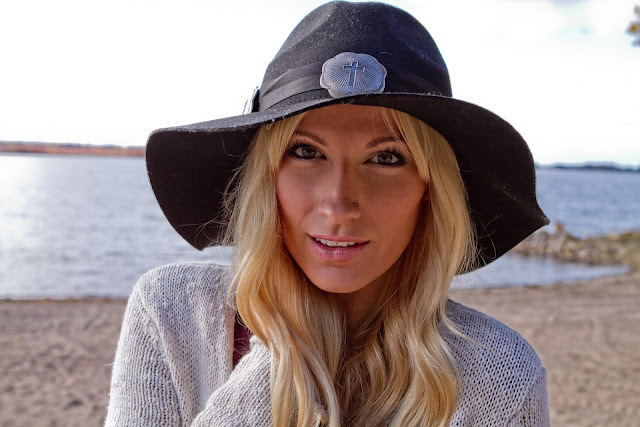 You look fabulous in a hat :) Beautiful photo shoot too! So beautiful pics!love the landscape! Love it!! The leather pants are amazing! That hat looks great :) You're so pretty! Love this outfit!!! This hat is amazing and you look gorgeous! Love the hat and the rest of the outfit, too. Unfortunately hats don´t suit me at all. The hat is wonderful, it looks very good on you! Love the hat! I'm not a big hat wearer either but when I do wear one I LOVE what it does for my outfit! You look so fallish. Love the mix of the leather leggings with the knit! OMG , i love your style <3! Love that cozy sweater!! Great photos, the scene is gorgeous. Great look, love the leggings a lot! I am your newest follower via gfc :) Feel free to visit my blog anytime. i´m your newest follower via gfc & bloglovin- i hope we stay in touch! Beautiful hat - you look super pretty. I love those leather pants too, they fit you perfectly! New follower there and on bloglovin.. This whole look is too cute. Love the shoes! I really LOVE your leggings and those wedges are killers ! love love love!!!! you are so pretty girl. xO! Very gorgeous and amazing dress. The idea of choosing the combinational outfit works and you are getting the advantage of it. The Hat and the tight pant are giving a good look.